You might have heard about micro needling treatment. Dermapen is a new form of micro needling. It is the advanced technology in aesthetic medicine. It has recently introduced as non-invasive skin rejuvenation in Dubai. It works just like an ordinary micro needling treatment. The adjustable needle penetrates the skin up to a controlled depth. The primary motive behind the dermapen treatment in Dubai is to rejuvenate the aging skin by tightening and lifting saggy and wrinkled skin. On the other hand, dermapen is also used around the world to treat many other skin conditions such as various types of scarring, stretch marks, age spots, sun damage and several types of skin pigmentation. Ellisys RF Microneedling can be used in this treatment. It is not a complicated treatment but the candidate must take due care to reap the utmost benefits from the Dermapen treatment in Dubai. Limit your alcohol intake during 3-5 days before treatment. It is better to quit smoking two weeks prior to the dermapen treatment in Dubai. 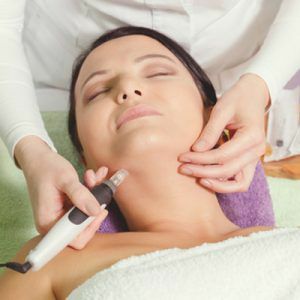 The cutting edge technology is used in the Dermapen treatment in Dubai. Micro-needling technique is used in dermapen. In fact, it is the evolution of traditional micro-needling treatment. Micro-needling originated from France in the early 1950s and gained so much popularity around the world. It has now evolved to become less invasive and more effective in recent years. It is the most effective and efficient micro-needling treatment these days. It has become totally safe and it causes less discomfort and pain. Dermapen technology works by inducing the skin’s self-repair through micro-injuries. Whenever a superficial injury occurs, the skin destroys damaged tissues to replace them with fresh, healthy tissues. Injuries caused to the skin at a controlled rate also trigger collagen and elastin production making the skin supple and smooth. Multiple needles of adjustable length are used in Dermapen Dubai treatment. The needles pierce the skin vertically to a controlled depth. As a result, the skin is repaid and new skin grows again. The treatment works in an efficient way. Eventually, the treatment delivers better results than traditional needling methods. At the same time, it involves minimal discomfort and much less epidermal damage. Multiple needs used at high speed allow the Dermapen to make multiple insertions simultaneously, thereby making the procedure quick and virtually painless. Avoid washing your face for 4 to 5 hours after the procedure. Wear sunscreen regularly, even if you aim to stay indoors all day. After that, wash your face completely. You can use a mild cleanser. Sun exposure will be harmful. You should take an umbrella while going out in sun. Do not apply products that may irritate your skin, especially those containing Retin-A and hydroxyl acids. You should not apply makeup or over the counter skin care products to the treatment area for two days. The results of this treatment are tremendous. You will notice a tremendous change in the surface of your skin within a week after Dermapen treatment in Dubai. Results are long-lasting and won’t require constant maintenance. The cost of the Dermapen is not very high in the UAE. The cost of Dermapen in Dubai is no longer a concern in the UAE. If you want to take this treatment, but you do not afford it, do not worry! Just contact us and avail our interest-free loan facility in the UAE. Dermapen is a good option if you want better results in a short time. Laser Skin Care Clinic has on board some of the finest dermatologists in Dubai. ­­­Dermapen in Sharjah and Abu Dhabi might interest you, that is why we also offer this treatment there. You are always welcome to contact us if you need more information. For a better understanding of the treatment, please feel free to sign up for a free consultation with one of our experts. Enlarged pores was an issue that i have been struggling with sine my teenage. I tried numerous home remedies and clinical procedures but nothing worked for my oily skin. Then a friend of mine told me about the latest skin rejuvenating technique named dermapen. Luckily Laser Skin Care was offering Dermapen in Dubai. Katrina Valente performed the procedure in a highly professional way. No pain, no scarring, no downtime. Dermapen is an ideal solution for enlarged pores. Try it today and enjoy clear, smooth skin. You Don't want to Miss Our Offer on Dermapen Treatment in Dubai . Fill in The Form To Avail Our Special Offer For You!